Major language: English and Maori (Look out for the New Zealand English and Maori pages on the Lewis Loves Languages Section). When visiting New Zealand, Lewis the Lion had never been so far away from home in his little life but in a strange way it felt a little bit like home because: 1) the weather was similar to the UK (just the reverse of the seasons with it lying in the Southern Hemisphere) 2) English is spoken there (as well as Maori), 3) the traffic flows on the lefthand side of the road and 4) some of the architecture was similar to what you may find in a British city and 5) it’s even about the size of Great Britain (although with a lot less people!). * It was 12 hours ahead of GMT (Greenwich Meantime). 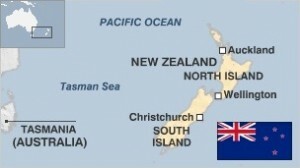 * New Zealand is made up of two main islands: the North Island and the South Island, along with several smaller islands. Lewis the Lion thought that New Zealand looked like a giant upside-down Wellington boot which was quite a useful way to remember the name of the capital city which is in fact called Wellington! * Most of the population (three-quarters) lives in the North Island with 1.3 million inhabitants living in Auckland. Today, of the 4.4 million New Zealanders (informally known as Kiwis), approximately 69% are of European descent, 14.6% are indigenous Māori, 9.2% Asian and 6.9% non-Māori Pacific Islanders. However, funnily enough, Lewis the Lion discovered that there are more sheep in New Zealand than people with 14 sheep to every one person! New Zealand is the world’s second largest producer of wool. * A Dutch explorer named Abel Tasman first sighted New Zealand in 1642 and anchored off Taitapu Bay (now Golden Bay). He made contact with the local Maoris without stepping foot on the island but the encounter didn’t go too well for him as they couldn’t understand each other. He thought the Maori were being friendly and waving at him to come closer. So when he neared the shore, the Maori attacked, killing three of his men and mortally wounding another. They Dutch left as quickly as they could being chased away by many canoes full of Maori! Because of this incident Tasman named the bay ‘Murderer’s Bay!’ How differently things might have turned out for Abel Tasman had he known Lewis the Lion’s three magic words in Maori?! * The first European to step foot on New Zealand soil was Captain James Cook, arriving in the Endeavour in October 1769. James Cook got on better with the Maori because he learnt to speak some some of their language! He then went on to successfully circumnavigate the North and South Islands, charting the coastline before discovering the east coast of Australia. He also identified many plants and animals previously unknown to European science. * New Zealand is a country with outstanding natural beauty. Even though it is a relatively small country it boasts 14 national parks, three of which are world heritage sites: Tongariro, Te Wahipounanu (in South West New Zealand including Fiordland, Westland, Mount Aspiring and Mount Cook National Parks) and the Subantartic Islands. Lewis the Lion wasn’t surprised therefore that the film director, Peter Jackson, has used New Zealand as the setting for his Lord of the Rings films. Lewis the Lion is sure he recognised many of these ‘natural sets’ as he travelled through New Zealand including when he did the Tongariro Alpine Crossing! * Lewis the Lion therefore wasn’t surprised to learn that this mountainous country was former home to one of the world’s greatest mountaineers: Sir Edmond Hillary (1919-2008) was the first man to climb to the top of the highest mountain in the world, Mount Everest in 1953. His image appears on the front of the New Zealand $5 note. * Owing to the fact that New Zealand has so much coastline (15,811 km), they estimate that 15% of New Zealanders own their own boat and are some of the top yachtsmen, sailers and rowers from around the world. However, Lewis the Lion discovered that the national sport is rugby and that the national team, The All Blacks, are famous for not only doing the haka but for being the current Rugby World Cup Champions. (Check out Lewis the Lion’s blog when he learns how to do the haka!). * Since New Zealand drifted away from the super continental unique flora and fauna has evolved leaving a great variety of different plants and animals. Look out especially for Lewis the Lion’s blogs on New Zealand’s national bird, the kiwi and a strange dinosaur like creature called the tuatara. * Lewis discovered that kiwis aren’t just a bird or people but also a type of famous fruit from New Zealand! He also came across a new kind of sweet in New Zealand called banana-lumps. A type of banana flavoured chew covered in chocolate! (Check out his blog on New Zealand food to discover what else he learnt about New Zealand food). * New Zealand also has a reputation for being the adventure capital of the world, particularly in the South Island around Queenstown. After all it was here where the bungy jump was created. Check out Lewis the Lion’s blogs to see if he had the guts to do any real thrill-seeking activities whilst in New Zealand!